Damn.....it's the Kentucky Derby Spike....you're supposed to wear a hat not a shower cap. Hmmm...Mr. 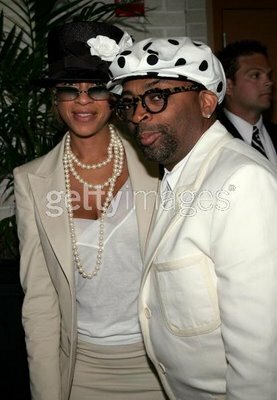 Socially Conscious himself, Spike Lee, going to the Kentucky Derby. Makes perfect sense! polka dots are hot but spike is not. if this sounds racist ...so be it. he looks like an oversized lawn jockey. perfect for the kentucky derby. i wonder if anyone tried to buy him for their lawn. I think Spike has lost his mind.